Hi I'm Stephen and I am licensed by the DVSA to give driving tuition. Before becoming a driving instructor I worked for 17 years in retail as a delivery driver where I gained a lot of experience about what it takes to be safe on our roads. I am passionate about passing on this knowledge and experience to new drivers. It is my hope it will help learners to develop safe driving skills for life. 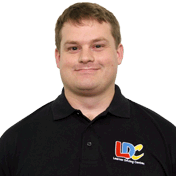 I chose to train and work with Learner Driving Centres’ (LDC) because by teaming up with LDC I have been trained and licensed to deliver lessons using their unique LD System of Tuition. What makes this system stand out from other methods of driving tuition is it’s flexibility to mold to a learners individual need. In other words, The LD System can ensure a learner, regardless of their natural ability behind the wheel, will achieve the most our of their “in car” lesson which in turn will help them gain their full UK license in the in the least amount of time and in the safest environment. Learning to drive safely at a rate that suits you means less stress and more progress! I aim to make every lesson enjoyable and as productive as possible. The LD System just helps me to do this more effectively. I have lived and worked in East Grinstead for over 10 years. I love living here because I enjoy the feel of a small town but like the benefits of being close to a big city like London. I find the history of the town fascinating and the people who live here are very kind and helpful.